Hotel breakfasts were Colin’s favourite part of press trips. Buffet-style setups were preferable so that he didn’t have to interact much with the hospitality staff, who he had mostly tried to avoid since an unfortunate incident a few years before when a receptionist—not paying attention to her typing—had carelessly issued him an invoice addressed to ‘Mr Colon’. When a waitress struggled to keep a straight face the following morning while pouring his coffee, Colin was convinced that everyone in the building had got wind of the misspelling and was in on the joke. Furious and embarrassed, he had checked out immediately and left the hotel a measly 1-star online review. But yes, what Colin liked best was a sprawling breakfast buffet with Continental and Full English options, so that he could combine food items as he wished. Not that he had a big appetite, but it was the illusion of variety and choice that mattered; it made him feel powerful, kingly; someone of great importance. Having finished his first course of fresh, cubed fruit (yellow hues only: banana, mango, honeydew) Colin got up from his seat near the window (grizzled with April rain), moving gingerly so as not to disturb the china teacup, pot and saucer placed on the thickly appliquéd tablecloth (which made its surface lumpen, and very impractical) and revisited the buffet table some distance away. On approaching it he made a small squeal of delight without opening his mouth. There on the end of the table: a toasting machine! He had not noticed it before, but now that he did, feelings of familiar awe flooded him. It was not a mere toaster, or toast rack, or one of those pitiful toasted-sandwich contraptions. It was a great hulk of machinery, totemic in its way, a steely grey monolith that reminded Colin of the elegant prowess of Donald Judd’s cubes (the galvanised iron series). The toasting machine was a rare sight nowadays; many hotels seemed to have dispensed with them altogether, and it was only certain frozen-in-time B&Bs, like this one, that kept them on (they must guzzle electricity like nothing else, Colin thought). The front of the machine was cut away in two wide slits, one above the other, between which a conveyer belt ran into the machine’s interior, glowing red-hot. You simply selected a slice of bread from the basket nearby, popped it on the topmost tray, and let the belt transport it inside. It would arrive on the bottom tray a few moments later, perfectly toasted. There was none of the disappointing tepidness of pre-toasted toast on a toast rack, or the enervation of hovering by a toaster to flip over the piece of bread too big for it, to ensure its even toasting. While waiting for his second piece of bread (brown, this time) to receive its baptism of fire in the machine’s hot interior, a strange impulse took hold of Colin. 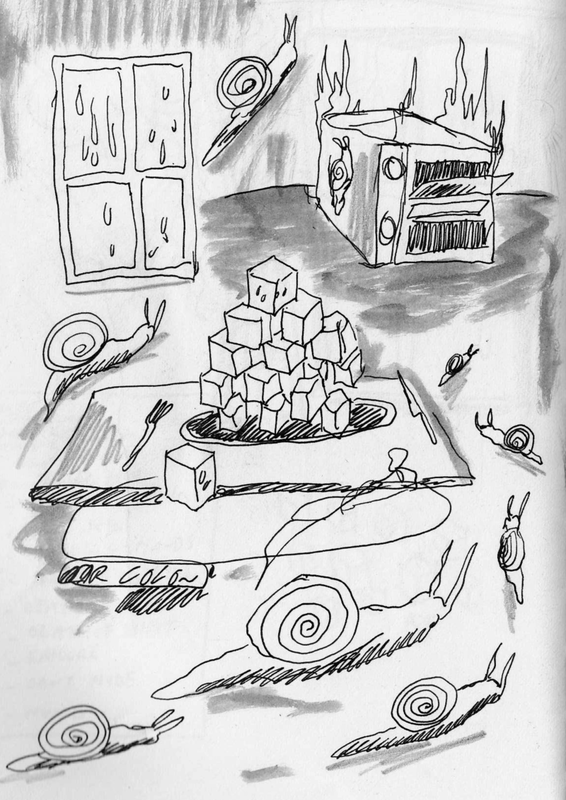 He imagined placing one—or maybe both—of Urs Fischer’s motorised snails on the toasting tray, and watching them disappear inside the machine. This was not the first time he had fantasised about destroying art objects, indeed, not the first time the art in question had been the very works he was sent on press trips to review. On visiting Fischer’s exhibition the day before, the two slime-less snails silently traversing the empty gallery space had irked Colin for reasons he couldn’t pinpoint, though he knew, inevitably, he would give them a pleasant, if not banally neutral review. In the midst of these thoughts he realised smoke was emanating from the toasting machine; his second piece of bread had not yet materialised in the bottom tray as toast, perhaps it had got stuck somewhere inside? Thin orange flames began to flicker out of the top and bottom slits, like little fingers signing profanities. As the waiting staff rushed over, Colin stepped back and tried to refocus on the metaphor that had been forming in his mind before the toasting machine set alight. It was something to do with the machine being like a metaphor for art criticism, converting the soft dough of artists’ intentions (“God! Someone call 999!”) into something palatable and digestible as mechanically-prepared toast. Or was the metaphor about the critic as gobbling automaton? Whatever it was, it wasn’t urgent, and could wait for his flight home, which was when the writing usually got done.